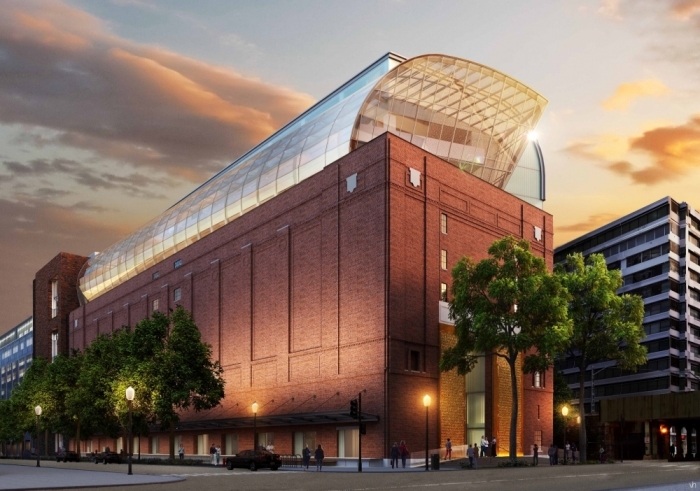 WASHINGTON – The forthcoming Museum of the Bible is currently an evolving skeleton of brick, rebar and concrete that reaches toward the D.C. skyline and will, on one floor of the edifice, encompass an entire city block. Up to 500 construction workers may at once mill about in neon safety gear building the non-sectarian museum that plans to be an unparalleled experiential walk through one of the world's most sacred texts. Museum President Cary Summers took The Christian Post behind the scenes on a hardhat tour through the 8-level construction zone last week, sharing the ongoing construction journey — a process that has presented a few challenges enroute to becoming arguably the first museum of its kind. The 100-year-old structure is undergoing its most extensive transformation yet and Summers told CP about some of the challenges faced thus far — beginning with outdated blueprints. "You may have the best idea based on the original blueprints, but it's a 100-year-old building," he said. "Things were modified that you don't know about, so they [Clark Construction] had to overcome that." Summers went into further detail. "The plans in 1923 show a column over here and it's not there anymore. By that [the original blueprints] you don't know what happened to it." "So you have to be very careful, and that's one reason that the initial construction on this site was really done with picks and shovels, because you didn't really know where everything was. But they're [Clark Construction] very good at it." Summers explained that that tedious process began in 2012 and continued for several months as workers cautiously ascertained the dimensions of the foundation. In the years since, work has steadily progressed and the museum is now about 50 percent complete. In what President Summers describes as "one of the great entrances in the world," the museum will welcome visitors with dramatic 40-foot tall 2 1/2 ton bronze doors depicting text from Genesis 1 of the first edition Gutenberg Bible. Beyond the doors, centered in the middle of the entrance, will be a glass replica of a Bodmer Papyri displaying Psalm 19, which is written in Greek, and is the oldest complete piece of the Psalm. It is owned by the museum, Summers said. "So when you walk in, you're really walking into the Bible." Just inside the entrance, visitors can purchase museum tickets, obtain information about the museum, peruse a gift shop and gaze up at a 40-foot tall, 150-foot long, 20-foot wide electronic ceiling "that can change by the second, by the hour," and will display biblical art and other scenes, Summers told The Christian Post. The museum's second floor, known as the Impact floor, explains how the Bible has impacted the world and will feature the Bible in America and Bible Global exhibits. This level incorporates innovative concepts that are oblivious to visitors, such as a raised floor topped by square-shaped steel plates that easily lift with a gentle tug. Directly beneath are electrical cables that building engineers can access. "It's designed so we can pull electrical [cables] throughout the whole museum without having to tear anything up ... So you can pull electrical throughout anywhere you want to in the museum. It's a very interesting system." The steel plates are overlayed by magnetic planks with wooden veneers resembling a traditional hardwood floor that is seamless to visitors. The planks can be lifted to expose the steel plates and ultimately access electrical cables, and are then repositioned back into place. A second floor coffee shop will give visitors a place to hangout and perhaps reflect upon what they've seen. Their experience has been considered even down to the smallest detail. Summers jokingly said that even paint colors for interior spaces are still being tweaked and that it may continue "until the day [they] open." The museum's third level, called the Narrative of the Bible, is the only floor that will have exhibits that are more enclosed than the others, Summers explained, and will have a Jewish Bible section which will be a "walk through" and comprise about half of that level. "You're walking through these various scenes dealing with time periods within the Bible. Abraham, David, and so forth." 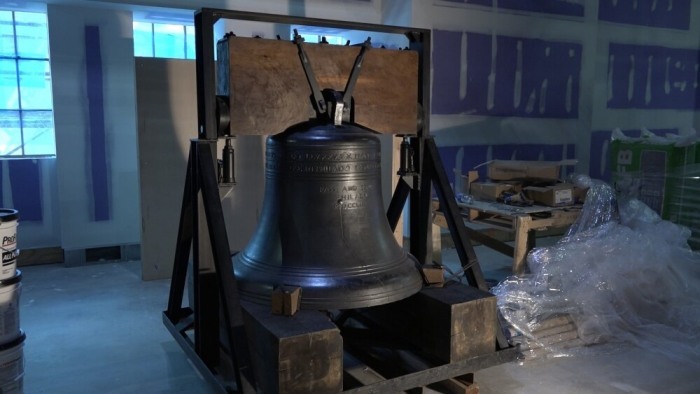 The floor will also house a replica of Philadelphia's iconic Liberty Bell. Summers believes, "It's one of seven Liberty Bells that were forged from the same mold as the one in Philadelphia." The Liberty Bell's Old Testament inscription comes from Leviticus 25:10: "Proclaim liberty throughout all the land unto all the inhabitants thereof." The History floor is on the fourth level. "It's wide open ... This one will [have] more of a traditional museum feel ... and have exhibits throughout the entire floor." The fifth level, which will fit within the footprint of an entire city block, contains a Performing Arts theater with lower, mid-level and balcony seating to accommodate a total of about 500 theatergoers, Summers said. The theater will host concerts and lectures. This level will also house artifacts on loan from the Israeli Antiquities Authority. In 2015, the Museum of the Bible announced a multi-year agreement with the IAA to display ancient artifacts from a trove of 2 million pieces from the country's National Treasures. The IAA, which has a say in the museum's design, will have its own display space on this floor. A portion of the sixth floor rooftop will be covered by a curving glass enclosure that is veiled by a special net applique designed to "bounce away" the sun's intense rays in a process known as "fricking." The rooftop area will also have lots of foliage to offset heat from the sun. A portion of the top floor will also be outfitted with stained glass windows. Summers added that the top floor will have a ballroom that seats 1,000, as well as 500 for dinner, making it an ideal destination for special gatherings. 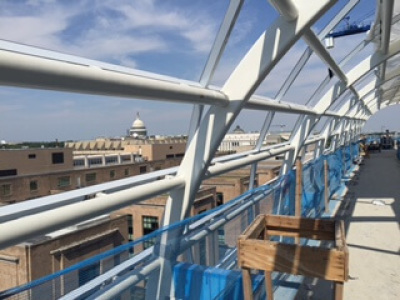 The top floor also offers picturesque views of the Capitol, Washington Monument, National Museum of the American Indian, the Smithsonian Institution and the Botanical Gardens. The Museum of the Bible opens Nov. 17, 2017.